Fly tying can be made easy. All the ways of catching a fish, few are as rewarding and as exciting as catching fish on home made flies you tied yourself. This craft, challenges it creator, the same as many famous sculptures of the artists of ancient times. The art of fly tying is a sculpture of an insect used to fool the fish into taking the hook. Materials of use are simple, wool, fur, feathers, tensile, and colored thread. All the many fly patterns used can be boiled down to a few basic elements. The tail, body, wing and hackle, completes a fly. Very few tools and material need to be gathered for use in fly tying. With a little practice you can create your own patterns to be tested, and named. Try to get an understanding of a fishes diet, what they are jumping for, what is available at certain times of the season. Different fish are attracted to different aquatic foods. We will confine our instructions to wet and dry flies with some photos of different aquatic insects and small amphibians. Most fish will eat anything available, anything a size of a mouth full. You would be surprised to know what a fish will try to put in its mouth. The trick is to make your hook real and life like. Fly tying is not a difficult art, nor should it be expensive to learn how to tie properly. Many beginners make the mistake of buying a large assortment of tools and materials, or, a fly tying kit with a colorful array of odds and ends, which do not do a specific job. When you learn how to tie flies there should be a purpose. Namely, to tie the flies that will also be effective when fished. We will be trying to describe how to tie four types of flies (Dries, wets, streamers and nymphs), which you will be able to use during the fishing season. Each of the patterns has been specifically selected so that you can go on to other patterns in the category with little difficulty. The requirements you will need shall be basic. If, after you have mastered certain fundamentals, you wish to purchase other tools and materials, by all means do so. For now, all you will need are the following items in order to tie the flies described herein. There are five basic tools necessary for the fly tying of flies. They are a vise, bobbin, hackle pliers, scissors and a dubbing needle. Vises come in a variety of price ranges. All you should be concerned with at the moment is that the jaws of the vise will hold an average sized hook properly without slippage. Bobbin: A tool designed to hold your thread. The simplest ones with self-adjusting tension are the best. Hackle Pliers: They should be capable of holding a hackle without allowing the hackle to slip from its jaws when a little tension is applied. There are many good ones on the market at very little cost. Scissors: Buy the best obtainable. What you want is a pair that meshes cleanly and has fine points. Fly tying scissors should be used for that purpose only. They are not designed for cutting cardboard or heavy twine. Dubbing Needle: Simply a pointed needle imbedded in a piece of wood, plastic or metal. It is used for poking out hackle fibers that have been unintentionally tied down and for applying head cement to the finished fly. Learn to tie Dry Flies, Wet Flies, Nymphs, Fly Fishing Knots and Whip Finish Knot. Cement, Wax and tying thread are not materials as such. You will need them, however, to hold the various materials together on the hook. 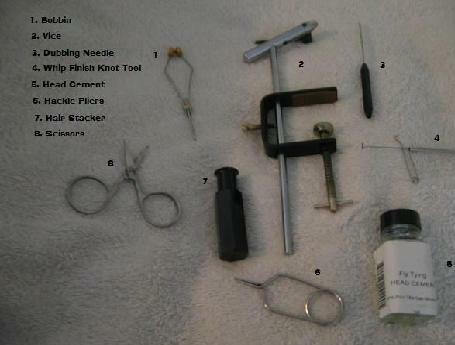 Here is a list of necessary items you will need for the fly tying of the flies in this course. Use this for a check list. Sport-Techniques.com - Your one-stop instructional fishing & sporting goods outlet. Learn it right * Play it forever!